If you’re going to be a roofer, then be the best damn professional there is. Not everyone is lucky enough to work with slate and copper…or should I say dedicated enough. It used to be that a roofer was someone who threw shingles on a roof. Now a roof is a system. A good mechanic will understand Building Science. 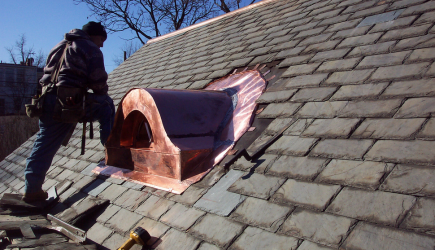 If it is residential roofing, then it could be slate, tile, steel, or even copper. You could be certified in CertainTeed or GAF. You might have a Building Envelope Certification from the Building Performance Institute. If it is commercial roofing, then a system might be Duro-last, PVC, GenFlex, EPDM, Modified Bitumen, or good old-fashioned BUR. In the 21st century, roofing is a science. It’s a skilled trade. It’s an art worth perfecting. Yes, it is hard work––perhaps some of the hardest out there. But it’s honest work. And work you can be proud of. A Journeyman level Roofer in Buffalo: Earns paid vacations. For the first year, you’ll get a week, along with paid holidays, and $17-$21 per hour. A Foreman can make $23-$26; get an extra week of vacation, a cell phone, and a truck. If you have a CDL drivers license, it’s worth at least an extra dollar. And a Service Mechanic will never be without work. If you’ve never worked in construction, and want to try your hand at roofing, we are hiring to fill entry-level positions right now. Consider work as a Roofer. The views are like none other!